← 478 "Angry Dad: The Movie"
The "Couch Gag Video Game" starts. The Simpson family members are selected as the players. When they take their seats on the couch, "GAME OVER" appears on the screen. I'm not here on a spitball scholarship. Santa's Little Helper flies by on a doghouse, in the same style as Snoopy. Werner Herzog as Walter Hotenhoffer. 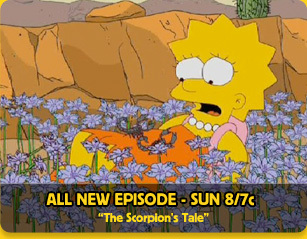 "The Scorpion's Tale" is the fifteenth episode of the twenty-second season of The Simpsons. It originally aired on March 6, 2011. "After a field trip to the desert, Lisa discovers that a desert flower mysteriously makes typically combative creatures get along, so she brings some of the flowers home as a souvenir. When Grampa moves in with the family after getting kicked out of the retirement home, Homer secretly tests the flower on Grampa, who is instantly cured of his crankiness. Walter Hotenhoffer gets word of Homer’s discovery and quickly tries to replicate the flower into a drug, using Grampa as the primary guinea pig. But when the pills get in the wrong hands and are sold on the black market, unexpected side effects of the new drug take an eye-popping toll on the elderly citizens of Springfield, and the Simpsons learn that their new medical cure comes with major consequences." During a "Satan's Anvil" trip, Martin finds an eccentric but grumpy hermit artist, whom the government tried to hire for years; Bart, Nelson and Milhouse find old postcards from France, and Lisa is nearly attacked by scorpions, but then the scorpions become passive due to silvertongue flowers, meaning she can take them home for further experiments. 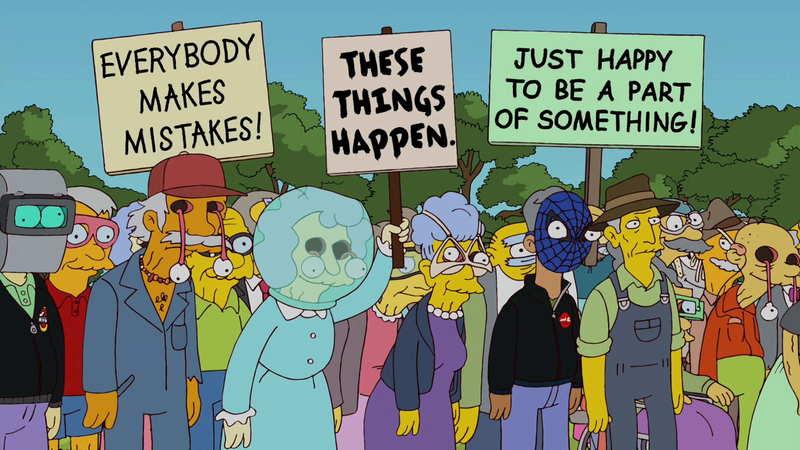 Grampa is then kicked out of the retirement castle because he is too grumpy; he needs to live with The Simpsons now. Lisa then confirms that silvertoungues has a powerful chemical agent. It nulls the negative feelings of a person. Homer puts some of this in Grampa's coffee, and he is soon happy. But Lisa refuses to give more of it. At Moe's Tavern, an employee of Hottenhoffer Pharmaceuticals named Walter Hottenhoffer (who was Augustus Gloop as a child), managed to duplicate the liquid's effects. So Hottenhoffer sells MusBeNys, but it is not properly tested, so only Grampa can use them. Unfortunately, Bart then sells some of the pills to people who are crabby, making them happy. The episode received 6.20 million viewers, and was edged out by the new episode of "Family Guy". Rowan Kaiser of the A.V. Club found Lisa's varied options annoying, but praised Herzog's performance. He gave the episode a "B-", the second highest rating of the night (next to Bob's Burgers). In the original Fox press release for the episode, Jackie Mason was listed as voicing Rabbi Krustofsky as a guest star, but his lines were cut. Rabbi was instead seen jumping rope in the park scene. ↑ Schedule (February 27 - March 5). FoxFlash. Modified on July 16, 2017, at 03:22.